Several photographs clued me in to the fact that my grandmother and her siblings had attended Immaculate Conception Catholic School in Manhattan's Lower East Side during the first two decades of the twentieth century. 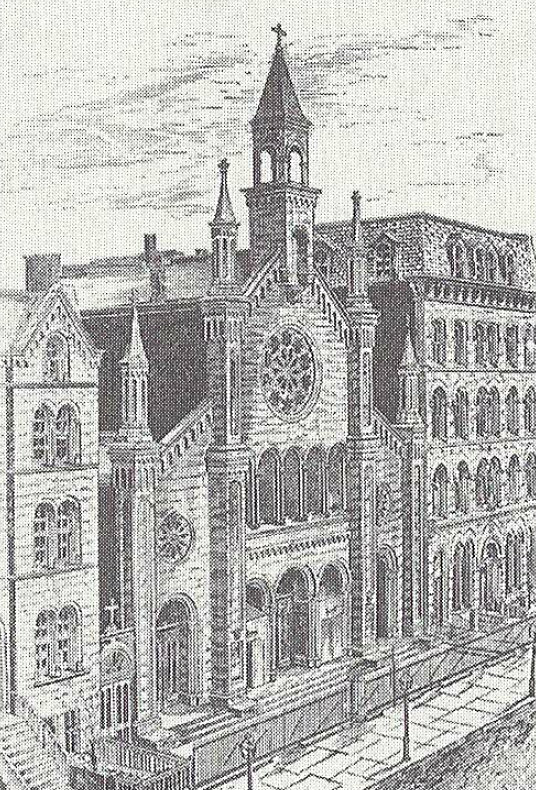 The family worshipped at St. Stephen of Hungary parish, but since that church had no school the children joined several thousand other students from immigrant families and attended school at what was then one of the busiest Catholic churches in New York City: Immaculate Conception. It took me a bit of sleuthing to learn the full history of Immaculate Conception and to unravel the mystery of the disappearance of its original church building. As the story goes, New York's Archbishop John Hughes was standing a few feet away from Pope Pius IX in Rome when the doctrine of the Immaculate Conception was first promulgated on December 8, 1854. "Just at that moment," Hughes later recalled, "I resolved, on my return to New York, to erect a church to commemorate the event." The cornerstone for Immaculate Conception Catholic Church was laid on December 8, 1855: exactly one year after Archbishop Hughes' had decided to build the parish. The beautiful Romanesque building was finally dedicated on May 16, 1858 by the archbishop, who declared it to be "the first church on earth set apart to honor the immaculate nature of the Mother of Christ." 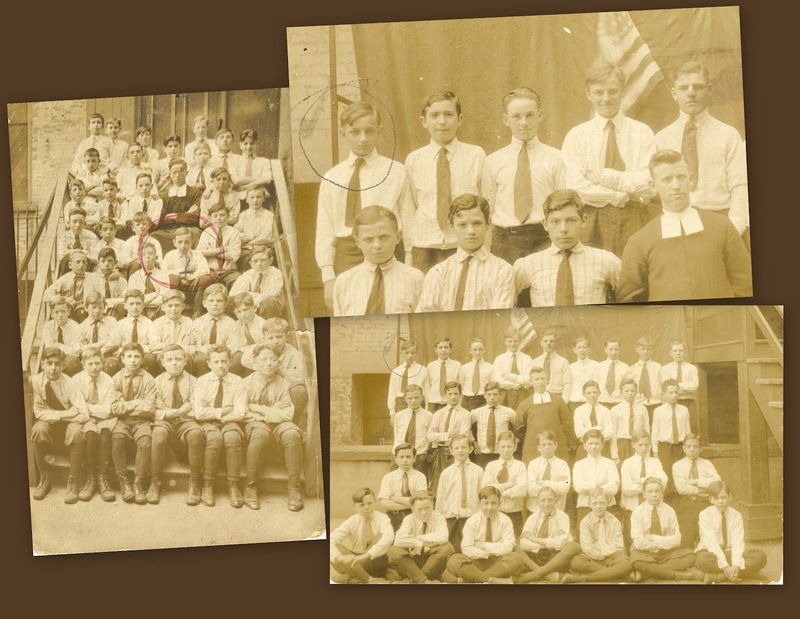 Several of the Ujlaky children, including oldest brother Frankie circled in the pictures below, attended Immaculate Conception Catholic School during the second decade of the twentieth century along with about 3,000 other children, mostly from immigrant families. 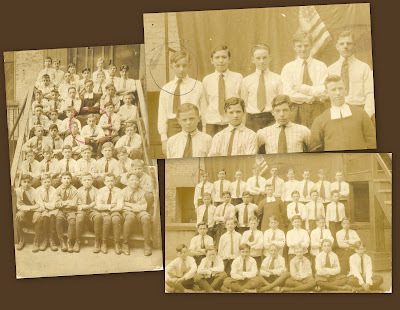 At that time the Sisters of Charity taught the girls; and the Christian Brothers, including Brother Aloysius pictured below with Frankie's class, taught the boys. 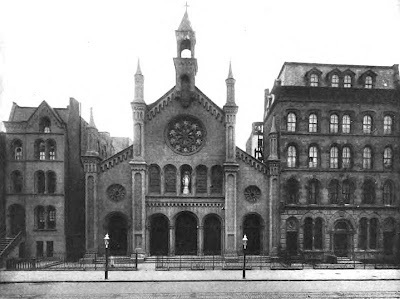 The first Immaculate Conception church building, its rectory, convent and school buildings were destroyed in the 1940s along with two other churches and many other buildings within the city blocks of 14th and 23rd streets from First Avenue to Avenue C. The reason: the building of Stuyvesant Town, the post-World War II urban housing development which remains today. 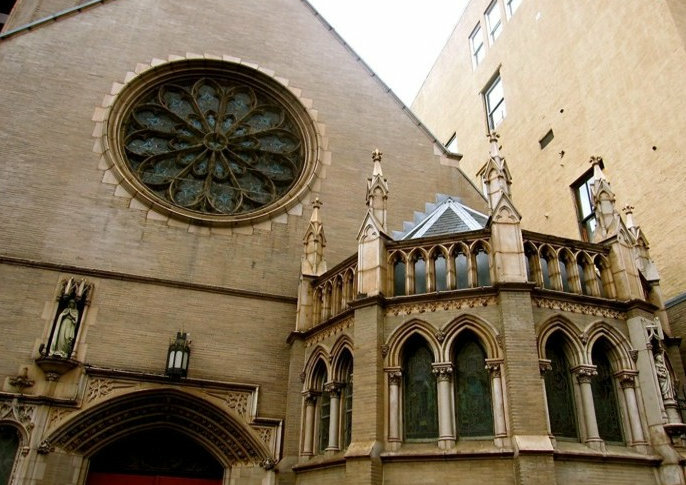 Immaculate Conception Catholic Church (and school) found a new home in the former Episcopal mission settlement called Grace Chapel, which was located on the south side of 14th Street, east of First Avenue at the address 406 East 14th Street. This church, just outside of the planned area for Stuyvesant Town, had lost its purpose as the neighborhood had largely become Catholic. 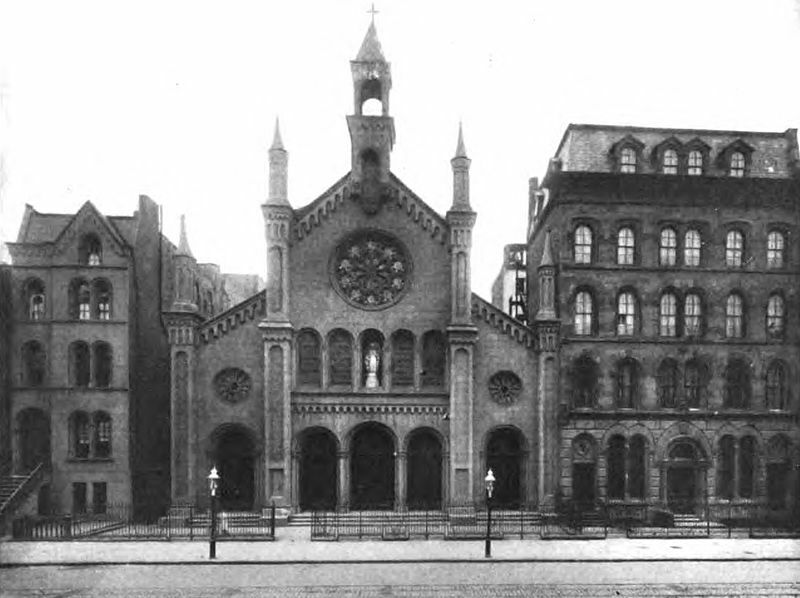 It closed in 1942 and was left vacant until the church and its affiliated buildings were purchased by the Archdiocese of New York and renamed Immaculate Conception. This remains the home of the Immaculate Conception church and school today: over 150 years after the founding of its original church home. most of the newest residents come not only from Europe but from all over the world. 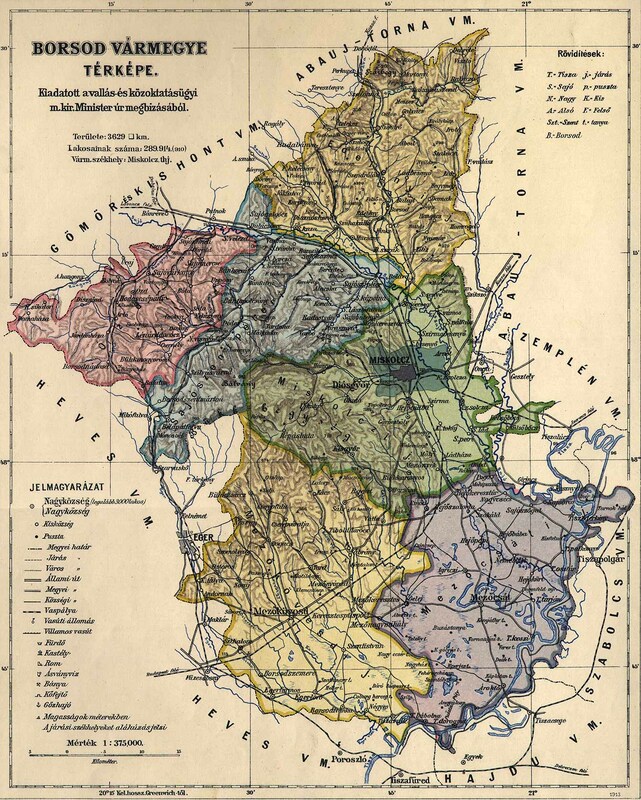 This is the city’s gift to the parish: a remarkably multi-ethnic, multi-cultural population, whose hearts burn with the same ambition: to create a better life for themselves, their children and their descendants. "Above the church door, there is a small but exquisite statue of the Blessed Virgin Mary from the first Immaculate Conception Church. The expression on her face is neither joyful nor sad; it is pensive. What could she be thinking? Is she calling all those men, women and children who have passed beneath her feet?" For more information about the history of Immaculate Conception Catholic Church, visit the church's website or refer to From Abyssinian to Zion: A Guide to Manhattan's Houses of Worship by David Dunlap. 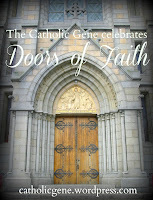 This article is part of the "Doors of Faith" series on our ancestors' Catholic parishes. Visit The Catholic Gene to learn how you can share photos and stories of your family's "Doors of Faith" in honor of the upcoming Year of Faith 2012-2013. So sad that the original church building was destroyed - but their new home is quite lovely too! What a small world , Lisa ! I was in Immaculate Conception about 20 years for the baptismal of my godson , James.His parent still live in StuyvesantTown. What a vibrant congregation it was then. Awesome! I thought this was the original structure. But either way the church really looks amazing. My mother attended Immaculate Conception School. 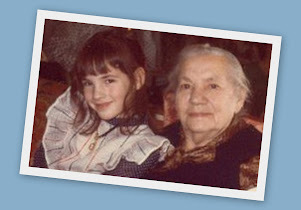 She was born in 1914. I remember her telling me that the boys were in one building and the girls in another, and that she was taught by the nuns. The family lived on 15th Street and Avenue A. 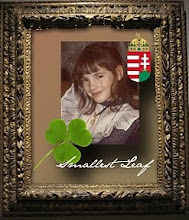 My grandfather was Italian and my grandmother was Hungarian. I wanted to visit the site where they lived but learned, as you shared, that Stuyvesant Town had been created and their old apartment building had been torn down. Thank you for sharing the picture and history of the church and its community.